A QUICK LUNCH FOR TWO – Chicken With Spaghetti and Caper Sauce | Crappy Kitchen - Good Dinners! If I had to choose when to go out to eat, it would be lunch time. I have plenty of reasons for not wanting to be in the kitchen (my favorite place in the world to be at dinner time!) right smack in the middle of the day when I am in the throes of all sorts of activities. Whether it is the weekend or some other day when the whole family is about, I might be grocery shopping, or cleaning my house, or doing laundry, or helping with homework, or out weeding or watering the garden, or perhaps at a movie or just plain old having fun with my kids or friends….I could (and have) go on and on about what kind of spanner is thrown into the works when I have to come to a grinding halt to make lunch! The worst is when I am on my holidays somewhere magnificent and we have to leave the museum or castle, or some majestic landscape to eat a midday meal. That why, when I was in Ireland for the Summer, I started taking lunch along ( like HERE and HERE to name but two great lunches on the go). So when the groan went up for lunch a few weekends ago, I sprung into action to get it over as quickly as possible. When I began to see how good it was turning out, I quickly grabbed my camera and a notebook to make sure I would remember to make this again – and I have, several times actually. It is not only fast, it is also pretty darn good! 1 – Put saute pan on medium heat (large enough to hold the finished dish) and add the oil. When it warms up, add the garlic and cook for about 30 seconds before adding the scallions. Cook for 2 minutes. 2 – Add the chicken and turn heat up slightly. Cook chicken for 5 minutes, stirring occasionally. 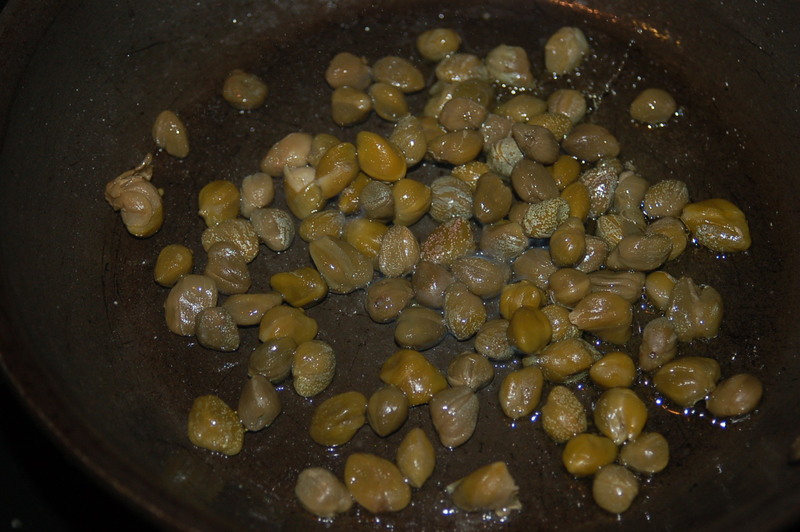 Add the capers and caper juice and cook for another 3 minutes. 3 – Add the cream and when it comes to a simmer, cover and cook (lower the heat) for about 1 more minute. Taste and add some salt or more caper juice if you think it needs it. 4 – At this point your spaghetti should be cooked. Add the reserved pasta water, followed by the cooked spaghetti and toss everything together. This entry was posted in dinners and tagged caper chicken, capers, capers and cream sauce, creamy pasta, fast lunch, lunch, quick lunch, spaghetti, spaghetti lunch. Bookmark the permalink.